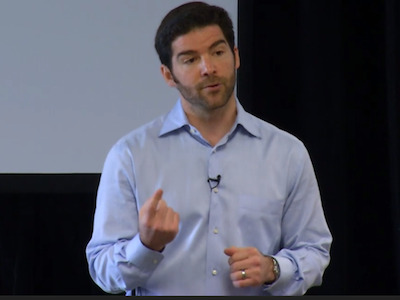 LinkedIn CEO Jeff Weiner keeps dropping clues about his company’s next big move.At the Morgan Stanley Technology Media & Telecom conference in San Francisco Monday, he mentioned that his company was testing tools for private information sharing. Since users already track professional contacts and trade information with them on LinkedIn, it’s not a stretch to create private versions of those tools limited to employees of a specific company. That sounds a lot like Microsoft’s Yammer or Salesforce.com’s Chatter. This is not a new strategy: Weiner revealed a similar internal test last summer to Fortune. And he mused about the idea in 2011 as well. So it’s clear that LinkedIn is moving very deliberately—OK, slowly—with testing these private-sharing products. LinkedIn’s line of business products is currently built around tools for recruiters. It recently started rolling out Sales Navigator, a tool to help salespeople find and develop leads. If there’s any reason for LinkedIn’s caution, it’s most likely that selling and marketing a new collaboration tool to a broad set of customers would be a challenge.